This monument sits​ at the top of Pound Gap between Union Kentucky and Confederate Virginia, overlooking this hotly contested, held off-and-on by both sides, area during the Civil War. It may be the only monument to the Civil War dedicated to both sides. For more information about the monument, click here. It’s a small cemetery, but it holds the final resting place of veterans of all the wars the United States fought in through Vietnam, and may some day be the resting place of veterans of our successive wars as well. Flags fly there that represent all those eras. During the Civil War the Branson family lived in a log cabin at the mouth of Crase’s Branch. Three of their sons fought, all on the same side. (Not always the case. Brothers really did fight on different sides in the Civil War, and circumstances led some combatants to fight on both sides.) Opposition forces caught the three brothers at home when one was convalescing from the battle of Lost Creek, and attacked the cabin. That cabin, riddled with bullets, survived about a hundred years before it burned, but none of the brothers survived that day. The last fled up Crases’ Branch, only to be found hiding in a fodder shock and bayoneted to death. Click here for more information about the Bransons' last days. Barn Christian was another soldier lost in that war. Barn’s wife was about to give birth, and he took leave to be with her. Neighbors on the other side learned of his presence, called him out, and shot him to death on his front porch in front of his wife. She gave birth that night to stillborn twins, and the three were buried in one grave. A monument in Barn Hollow commemorates that event. The hospital is no longer there, but locals have restored and beautifully maintain the graveyard where dozens of the men who died of their wounds while in the hospital are buried. 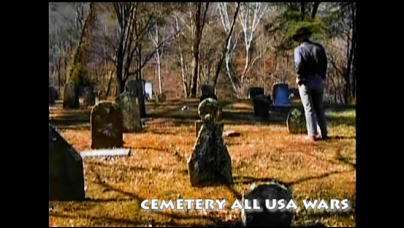 For more information about the graveyard and its restoration, click here. On the weekend in October nearest the historic date, Civil War re-enactment groups come from all over to restage the Battle of Leatherwood. 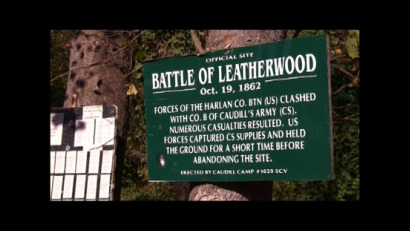 The battle site is just off Kentucky Route 7 near the Letcher/Perry County Line. Come and talk with "General Robert E. Lee" or "President Abraham Lincoln," tour the old buildings, take in the period clothes, browse the sutler's booths, read the list of battle participants, and watch the battle. On the first day, while the site is open to the public, the re-enactors generally devote the bulk of their attention to touring groups of schoolchildren. The two successive days feature the battle re-enactments. Click here for more information.